Events – Центр "Нова Європа"
NEC presented a discussion paper on Ukraine-Italy relations in a wider European context. 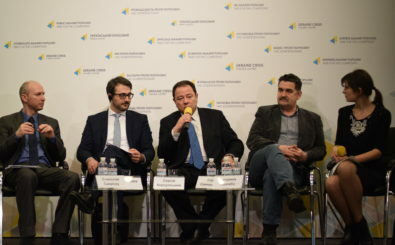 New Europe Center presented the opinion poll results on Ukrainians’ expectations regarding certain issues of the foreign policy of Ukraine’s future President. The New Europe Center decided to look at the foreign policy of Ukraine in 2018 through cartoons. The Eastern Partnership Think-Tank Forum 2018 won the Award of the Eastern Partnership Civil Society Forum (EaP CSF) Annual Assembly. How to counter Russia’s subversive activities in the European Union? On December 10, the NEC presented a policy paper “Atrophy of Trophies. How Can Ukraine Take Advantage of the Vulnerabilities of Russian Policies in the EU?“.